Hi there, it's me again. You know, the person who blogged for a few years rather religiously and then dropped off the face of the earth? Well, I'm back. What have I been doing, you ask? Well, there has been that rather time-consuming task of parenting two brilliant and hard headed little girls, did I mention they're cute? Because they are. So cute that if you're on Facebook you see them all the time. That's the other thing that seems to have taken up way more time than I would care to admit. The creation of Facebook ruined my blogging, that's the real culprit of my failure to blog and let's be honest, it's much more easy on me to blame a website than my own laziness. If you're not a friend of mine on Facebook and haven't seen the kids for a while, well, here you go. They're cute, right? Told ya. I've also been doing this little thing called cake decorating. Wasn't really planning on having it turn into anything but it seems to have started to turn into a beast of it's own. If I decide to make something more of this we will see, but so far, it's fun. Here are some cakes I've decorated. It's never been a secret to most people who know me that I love to cook and I have decided to try and take my blog more in that direction.. things that interest me and keep me busy rather than to just go on and on about what my kids do. Not that Avery and Hadleigh aren't interesting and fun subjects, and there will still be plenty of anecdotes about them because they are so entertaining, but I think it's time to start remembering who I am and was before the two little people who bless me most came along. If I had endless supplies of money one of the first things I would do would be to sign up for culinary school with a focus on being a pastry chef. I find cooking and baking extremely relaxing, something I know many people do not find it to be, but for me, the one place I feel most at ease is in my kitchen tweaking a new recipe or creating one of my own. I guess, because I am not a very artistic person (I can't even draw a stick figure) creating recipes is my own personal version of art. My favorite time is on the weekend when Rob is entertaining the girls and I can go into the kitchen, pour myself a glass of wine, put a chick flick on the big screen tv (we have a great room which encompasses the kitchen and family room) and cook a fantastic meal. My own personal heaven. I get asked frequently for recipes and ideas for meals and because of that I'm going to start putting different recipes that my family and friends enjoy on my blog. It's not that I think my recipes are so fantastic that you can't live without them, I just figure, why not? Who doesn't like to try something new and something they wouldn't have tried if they hadn't heard they really, really should? It's just me trying to put some happiness out into the world. With that said, here's a recipe for a family favorite. We usually only make these a couple times of year because it's hard not to eat the whole tray within a day, and it's somewhat naughty, don't let the fruit fool you. So great with a cup of coffee or tea on a weekend morning! In a bowl, combine flour, oats, 1/2 cup white sugar, 1/2 cup brown sugar, baking soda, salt and cinnamon. Cut in butter until mixture resembles coarse crumbs. Reserve 2 cups for topping. Press remaining crumb mixture into a greased 13-in. x 9-in. x 2-in. baking pan; set aside. In a saucepan, combine blueberries, cornstarch, lemon juice and remaining 1/2 cup sugar. Bring to a boil; boil for 2 minutes, stirring constantly. Spread evenly over the crust. Sprinkle with the reserved crumb mixture. Bake at 375 degrees F for 35 minutes or until lightly browned. Cool before cutting. Enjoy! Wow!! I am so impressed with your cake decorating ability. I started to get into it for awhile but my cakes never turned out anything like yours. You have the talent for it. I agree that your girls are CUTE!! They couldn't be any cuter. I also love to bake and cook. 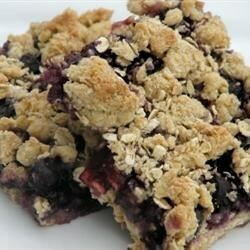 These blueberry bars look and sound really good. I will look forward to trying out your recipes. Great to have you back! But I'm feeling SERIOUSLY left out between the cake decorating talents of you and Sus... you need to come over here and do a master class! Those cakes are amazing! And your daughters are darling. ;) Hope to see you at the gymnastics meet on Friday! You're a true artist Jenny!! A great friend who I've managed to remain in contact with since high school. The girl is uber-talented and will try anything... try to keep up.